Most reviewers who purchased the Floral Leaf 7 Piece Jacquard Comforter Set admit they went for it for the price – at under $25 (on sale) and around $50 normally, the seven piece set seems like a steal. Most agree that it is worth at least what they paid if not much more – the comforter is warm but light and the sheets are comfortable for the thread count. Several reviewers were slightly disappointed in the quality of the material, but again said for the price they paid it was still a great bargain. The pillows and bed skirt are a plus for those consumers looking for a quick room makeover, and two mentioned they were easy to coordinate sheets or drapes with. The look of the product belies the apparent inexpensiveness; even the harshest reviews agree that the set looks very good and adds a splash of color and ambience to a bedroom suite. The design on the comforter is stitched on rather than printed, and the silky feel of the reverse side coupled with the showy bolster pillows made most of those reviewed happy with the overall feel and look. The set apparently specifies dry clean only, but one reviewer claims it washes just fine at home, putting another checkmark in the ‘plus’ column. A decent product for a good price is the consensus of 90% of those surveyed, and all agree it looks terrific on their bed. This product ends up with a solid four plus stars across the board as a luxurious looking product and a good deal. 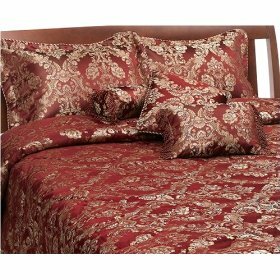 The set is available in queen and king sizes and comes in Burgundy and Gold floral leaf colors. are mostly positive. The only downside mentioned is that the comforters shed feathery down, but one consumer got around this nicely by enclosing it in a duvet, and nearly all who mentioned the shedding said it wouldn’t stop them from buying another. Other than that, the comforter is mostly raved over. 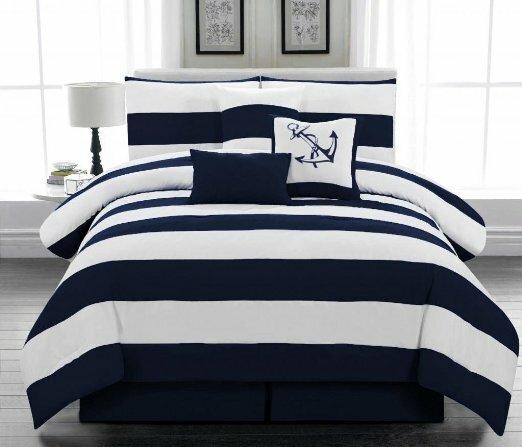 Most reviewers commented on how gorgeous their comforter set is, and how warm it keeps them. The lightweight feel and the classy faux suede fabric is a major plus, as the comforter can keep you warm without feeling heavy, and the look fits almost any décor. On average, the biggest plus was the feel of the comforter and the biggest downside was the feathers poking through – still, nearly all consumers said it was worth the shedding just for the comfort! 60% of reviewers stated they bought more than one, and 85% said it would make a great gift. One reviewer from Florida weighed in saying that the comforter was perfect for the warmer temperatures, while some from Pennsylvania said it kept them warm and cozy even in the dead of winter. Several consumers stated they liked the fact that it spot cleans easily with just a rag wet with a little soap and water. Four or five stars in 22 out of 27 reviews, with only one negative rating. 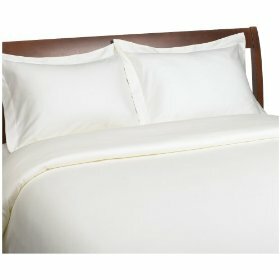 For under $40, this comforter/pillowcase set seems to be a very good pick as far as consumers are concerned. Most recommend getting a size larger than required for your bed in order to leave extra blanket to snuggle down in! Many consumers rave about the plush, soft feel and unusually fuzzy texture of the Sharpay Plush Fleece Bed Blanket and claim it is one of their favorite choices for their bed. It seems like a wonderful blanket to use, as five out of six people rate it extremely high, stating that they can‘t get over just how soft and velvety the texture is. Other reviews specifically mention that the colors used are bright and true, and stand up to washing without losing their brightness – another plus when compared to similar products. The throw isn’t as cheap as some others in its class, but most consumers claimed the value of the Sharpay Plush Fleece Bed Blanket made it worth the extra cost. The fuzziness of the product did bring in mixed reviews, but the majority of consumers loved the texture. 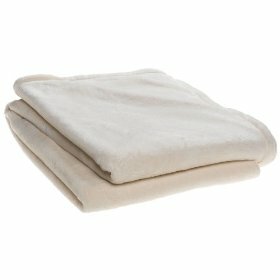 It is recommended that the blanket be washed before use to contain any shedding and remove any loose filaments. Depending on the size that is bought, the blanket can be used as a simple throw on a couch or chair, or of course, as its intended use on the bed of the appropriate size. 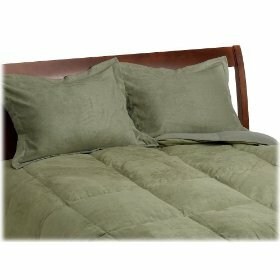 Most of those reviewed use it as a bed throw, and approve of its weight and the extra warmth it gives. Even with the few who rated the blanket lower than a three because of the shedding, the rating is still a solid four point five stars. The Faribault Mills Waffle Weave Cotton Blanket looks just like a huge waffle due to the unusual weave of the fabric. Consumer reviews reveal an overall satisfaction with the Waffle Weave Blanket, for many different reasons including warmth, versatility, affordability and durability. Most consumers reviewed mentioned the blanket worked very well to increase the warmth of their bed (the weave creates small pockets which trap heated air if used between sheet and coverlet). The length and width also makes the blanket useful in a practical sense as it doesn’t come un-tucked or shift while in use on a bed. Versatility between seasons is another topic brought up; it manages to keep consumers warm in just the right way no matter what the season. There are some comments about the large amount of lint that occurs a for the first few times the blanket is washed and dried, although this settles down after a few washes. 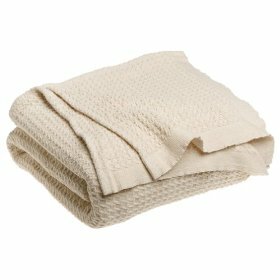 In general, almost everyone who rated the Faribault Mills Waffle Weave 100% Upland Cotton Blanket rated it at least a four or above. Only three consumers rated it below a four, making it a good, solid four point five stars. Virtually a rainbow of colors is available when ordering the Berkshire Softest Microloft Blanket, and apparently the whole rainbow range is very soft to the touch. 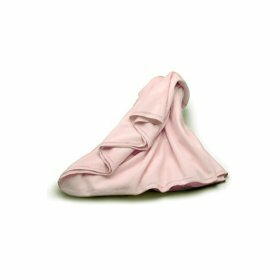 Most of the reviewers using this product state that it lives up to its claim of ’softest’ blanket, and added that it is thoroughly versatile as an all-season blanket. Users like the fact that the range of colors was so broad, stating it was hard to find products with such a range of choices. The blanket is designed to be equally appropriate for use in both summer and winter and this is supported by users who state they would be able to keep the blanket on their bed year round. 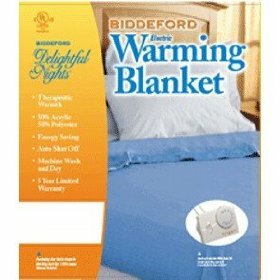 Another advantage that most all consumers were very pleased with is the fact that the Berkshire Softest Microloft Blanket doesn’t seem to pill up at all. The material stays intact and soft, even after repeated washings, and doesn’t shed or cause excess lint to build up. There were a couple of comments from consumers who felt that the Berkshire Softest Microloft Blanket didn’t live up to the standards that they expected – that they did experience some pilling with their blankets, and that the material was not what they expected from the advertisements that prompted them to buy the product. This is a minority opinion, however —out of all the reviews, only three reviews have a three star rating or less. Of the 19 people who reviewed the Berkshire Softest Microloft Blanket, at least eighty five percent of the reviews showed a very high four or five star rating, making the blanket a well reviewed product worth the money paid.